The Pittsburgh Penguins on Thursday announced they've agreed to an eight-year, $76-million US contract extension for former NHL Most Valuable Player Evgeni Malkin, who was due to hit the free-agent market next summer. The Pittsburgh Penguins on Thursday announced they've agreed to an eight-year, $76-million US contract extension for 2011-12 NHL Most Valuable Player Evgeni Malkin, who was due to hit the free-agent market next summer. Malkin will earn $9.5 million US for each season through to the deal's 2021-22 expiration, the club announced. 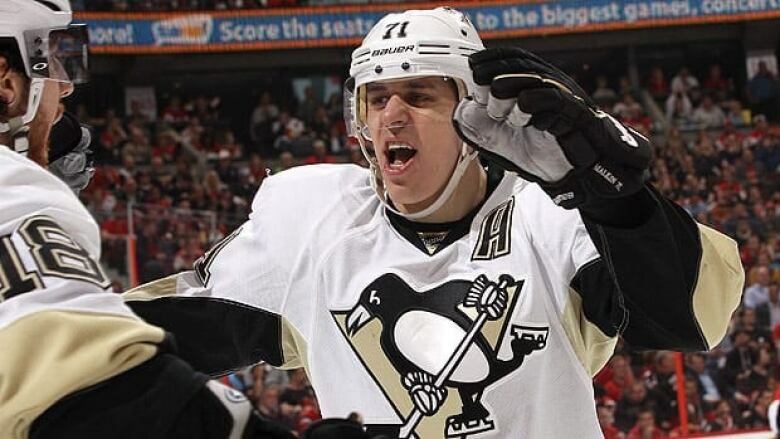 Malkin, who turns 27 in July, will earn $7.5 million next season under his old deal, with a cap hit of $8.7 million. "I like the city, is good for hockey," the Russian centre said. "I like fans. I have house here and all my friends here. It's good for me." For comparison's sake, captain Sidney Crosby is under contract through 2024-25 under a front-loaded deal signed before the lockout. He earns $12 million US the next three seasons before his pay rate decreases, but the cap hit through the entirety of the deal is $8.7 million. "When you have two world-class players like this, you do everything you can to keep them," Penguins general manager Ray Shero said. Malkin has gone over 100 points in three of his seven NHL seasons after being selected second overall in the 2004 draft. On two of those occasions, Malkin was the league's leading scorer. He won the Hart Memorial Trophy and Ted Lindsay Award winner as the NHL's top player as voted on by writers and players, respectively, after putting up 50 goals and 59 assists in 2011-12. Malkin also earned the Conn Smythe Trophy as playoff most valuable player in 2009 when the Penguins captured the Stanley Cup, and he was named the Calder Trophy recipient as top rookie in 2007. For his career, he's scored 217 goals and 343 assists for 560 points in 458 games. No stranger to the penalty box, he's compiled 462 penalty minutes. The announcement came just a day after Shero held his end-of-season media availability, with the Pittsburgh general manager offering no hint the Malkin pact was imminent. Malkin put up four goals and 12 assists in 15 playoff games this year, but like nearly all of the Penguins, was held off the scoresheet in the club's stunning four-game defeat to Boston in the Eastern Conference final. After winning the Cup in 2009, Pittsburgh has prevailed in just three of seven playoff series, but Malkin is not too dispirited. "We're still young and can stay here a long time," Malkin said. "We're a group that we've won Stanley Cup before and I believe we will again." For Shero, one of the summer priorities is to talk to Norris Trophy finalist Kris Letang, who is scheduled to be an unrestricted free agent in 2014. He is expected to be angling for a significant pay bump from the $3.5 million per season he is currently earning. "We'll certainly turn our attention to Kris here over the next little bit and see if we're in the same ballpark," Shero said. "He's certainly a key player for us."